The exceptionally fine underfur of the Tibetan antelope or chiru insulates it against the harsh climate of the Tibetan plateau. Unfortunately, this fur, known as shahtoosh, also makes the chiru a target for illegal hunters. Demand for shahtoosh, which is used to make luxury shawls, has pushed the Tibetan antelope to the brink of extinction. The wool is so fine, the shawls can be pulled through a wedding ring. However, the antelope must be killed for the fur to be collected, and it takes around 4 chiru to make a single shawl. Shahtoosh shawls were traditionally given as wedding gifts in India. Despite strict controls on trade of shahtoosh products and CITES listing, there is still demand for these luxury items. Within India, shawls are worth $1,000-$5,000, internationally the price can reach as high as $20,000. The Tibetan antelope has a fine, soft and dense woolly coat which varies from grey, beige to reddish-brown. The underparts are creamy white in colour. The male chiru has curved back horns up to 70cm in length. Tibetan antelope is a priority species. WWF treats priority species as one of the most ecologically, economically and/or culturally important species on our planet. And so we are working to ensure such species can live and thrive in their natural habitats. Chiru are found on the Tibetan plateau, the highest, biggest and most remote plateau in the world. Chiru inhabitat high altitude plains, undulating hills and montane valleys at elevations of up to 5,500m. Chiru are nomadic and migratory, sometimes covering huge distances between summer and winter ranges. 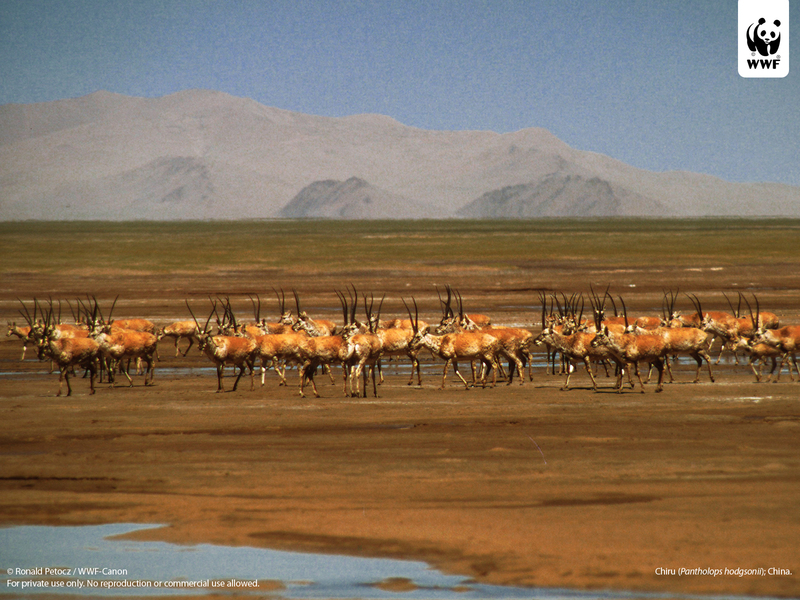 Male and female herds are usually separate except during mating. Chiru usually give birth to a single offspring. Females congregate at traditional birthing grounds. The population is estimated to have declined by more than 50% during the last 20 years of the 20th century. The chiru once ranged across the whole Tibetan Plateau, but is now absent from all or most of the eastern plateau, the main stronghold of the species is in the remote Chang Tang area of north-western Tibet. Commercial hunting of chiru for the underfur had a serious impact on the species, Despite CITES protection, illegal hunting continues to pose a threat. Expansion of livestock herding into remote areas and fencing of pastures on the Tibetan plateau have also had an impact. 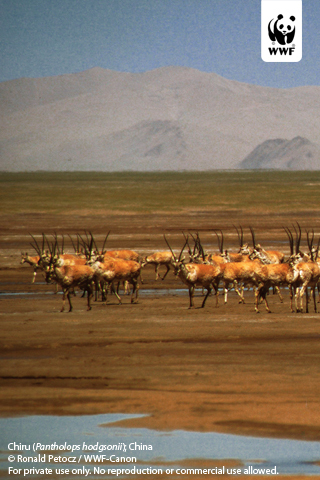 The construction of the Beijing-Lhasa railway cut off migration routes for the Tibetan antelope. Whilst tunnels have since been constructed to allow migration, improved access to this remote area also facilitates poaching. WWF promotes the work of Traffic which works to combat illegal trade in endangered species. WWF seeks to raise awareness of the threat facing the Tibetan antelope and assists in the implementation of measures to improve poaching controls. WWF works together with local herders, village leaders and reserve managers to develop conservation strategies and measures to tackle poaching and illegal hunting. It works with the Tibetan Forestry Bureau to jointly develop and implement a conservation and management of the Chang Tang nature reserve. Don't buy it! Although it is illegal, it is still possible to buy shahtoosh. Purchases fuel demand and lead to more hunting. Spread the word! Share this information with others via email or a social network service. The hair of the Tibetan antelope measures three-quarters the width of cashmere and a fifth that of human hair. Chiru can run up to 80kph. Almost half of the Tibetan antelope offspring die within 2 months of their birth.